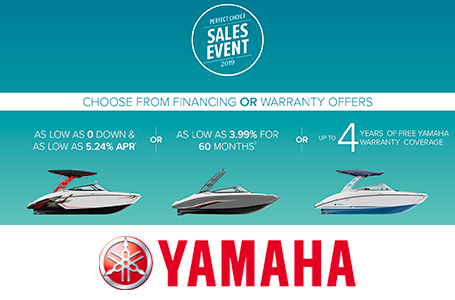 Scroll over to watch a video we made of the Yamaha boats that we carry. While the boats used in the video may be one to two model years newer, it's still a great way to get to know the brand! •Built for high performance and fuel efficiency, the 1.8 SVHO® engine maximizes the fun of the 195 series boats. •New deck and hull design maximizes space, comfort and versatility unlike any other 19-foot boat. •Co-captain's station with beverage center, fold-down table, lockable storage and added USB charger. •Snap-in marine-grade woven vinyl floor mats come standard on all Yamaha 19 FT boats. •Yamaha's award winning 4.3" touchscreen display with adjustable phone holder.